The ST200 is a $20 budget super tweeter by Selenium. As in all Selenium products, it’s intended for the pro sound market. According to their specs, the ST200 is rated at 140W Musical Program when crossed at 5,000Hz (12dB/oct). The Frequency Response at -6dB is from 2kHz~20kHz. Dispersion pattern is 40° conical and comes with a phenolic diaphragm. Fig 1 is the Impedance sweep of the Selenium ST200. Resonant frequency (Fs) is a rather high 3kHz. The impedance peak at Fs looks well damped which is an advantage. Lowest impedance is 7Ω at 5kHz. Fig 2 – Selenium ST200 RAW Frequency Response. Fig 2 shows a fairly flat frequency response from 3kHz~10kHz. After that, it dies off quite rapidly. Even though Selenium recommends crossing at 5kHz at 12dB/oct, I think it’ll be fine at 4kHz with 18dB/oct. If one wants to push it, it can go to 3kHz at 24dB/oct. Below 3kHz, the horn cuts off. The highly magnified (1ms) Waterfall plot in Fig 3 shows minimal artifacts from 5kHz onwards. It looks like a very “clean” tweeter. 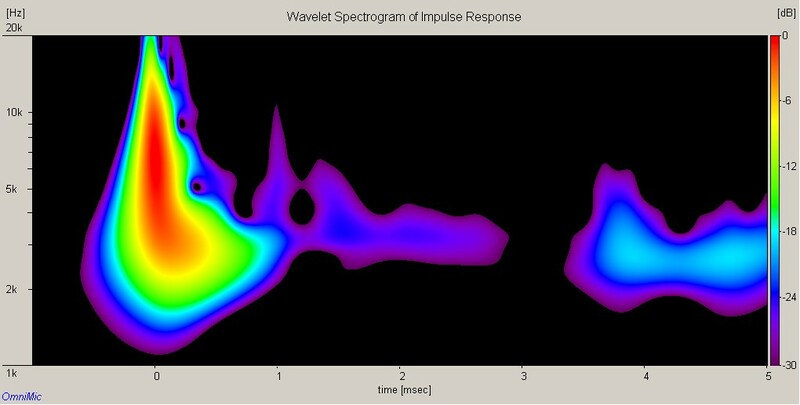 The Toneburst Energy Storage plot In Fig 4 shows stored energy (light blue slices) from 3kHz~6kHz. It’s not critical because they last for only 10 cycles at most. The Spectrogram in Fig 5 gives us a better idea of the stored energy. It is at 3kHz where the stored energy is most. However, it last for less than 3ms. The Violet patch is -30dB below the fundamental. From 4kHz upwards, the artifacts seen in the waterfall do not last even 1ms. On paper, the Selenium ST200 looks good but on closer examination, I am not too comfortable with the bandwidth. Working from 4kHz~10kHz is rather awkward. I dislike crossing a tweeter at 4kHz but perhaps with the right woofer, the speaker may still sound good. It would have been so much better if the ST200 has a bandwidth of 2.5kHz~15kHz but for a mere $20, it is already a great bargain.